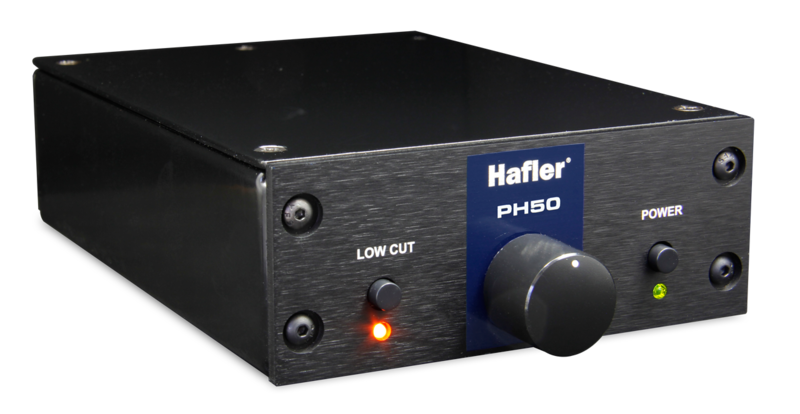 The Hafler PH50B is a high performance phono stage for moving magnet (MM) cartridges, with the ability to easily connect to HIFI playback systems or pro audio recording and playback equipment. It features a well-defined RIAA curve to preserve the source material and an exceptionally low noise profile for quiet distortion-free operation. The PH50B is housed in a 14-gauge steel enclosure to shield against radio and electromagnetic interference, with gold-plated input and output RCA connectors that ensure optimal signal transfer and won’t tarnish over time. XLR output connectors provide balanced +4dB professional line level signals for connection to recording interfaces or pro audio systems, so you can digitize your vinyl collection without needing an additional gain stage. Solid state circuitry and a military grade circuit board provide minimal self-noise and cross-talk, and an external supply further reduces noise by removing the power transformer from inside the casing. Front panel controls include a power on-off switch and a variable low cut filter that may be inserted into the signal path when needed. The fully adjustable low cut filter enables the user to reduce low frequencies that can cause resonance and feedback when playing music at higher levels. This helps eliminate both airborne and solidly coupled transmission of vibrations that can disrupt the stylus and cause feedback, rumble and distortion. Lastly, a ground lift switch helps eliminate buzz and hum from ground loops when using the XLR outputs. 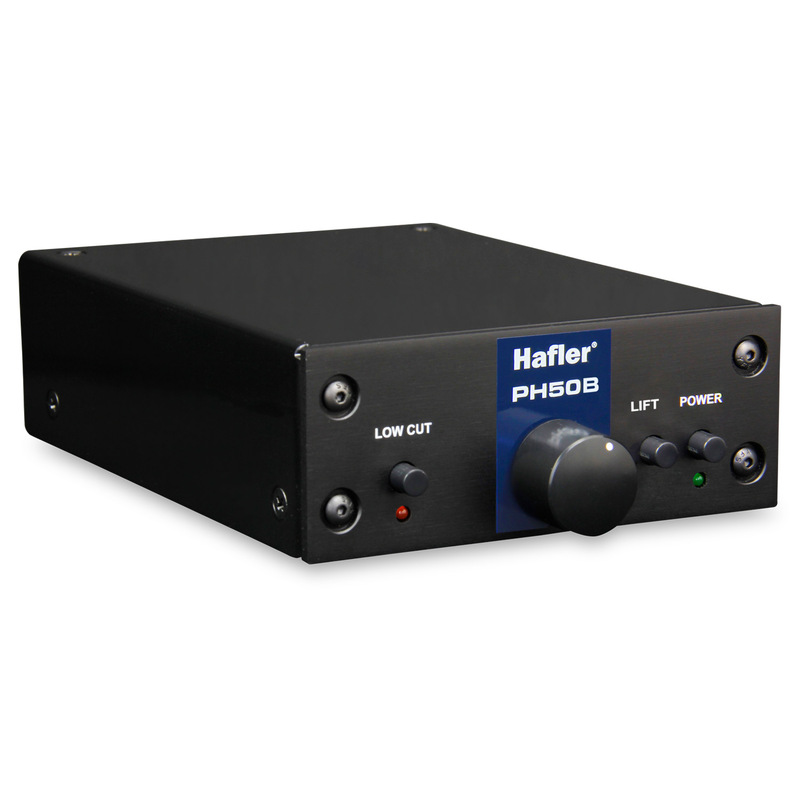 The Hafler PH50B is compact, reliable and versatile, with outstanding audio quality that allows you to easily connect to HIFI systems or pro audio recording equipment. Connects from the turntable to the PH50B. Features 47k-ohm standard input for moving magnet cartridges. Gold plated to eliminate tarnishing and ensure optimal signal transfer. 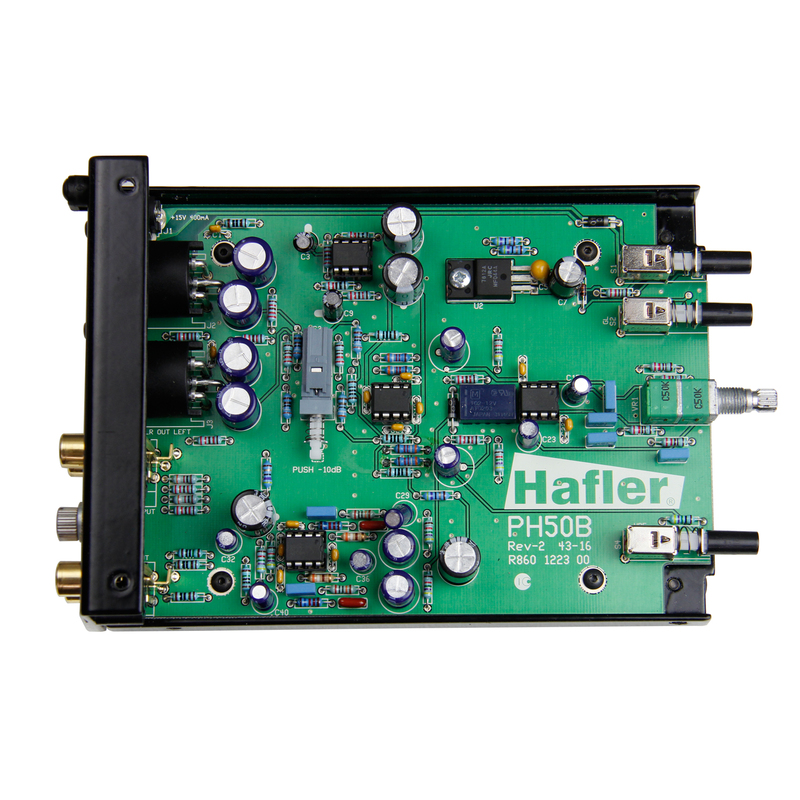 To optimize signal transfer, the PH50B employs metal-film resistors along with full-sized capacitors that are hand inserted to deliver the very best audio quality. Ultra high quality switches and potentiometers employ steel casings and metal shafts for long-term reliability. Switches are rated at over 20,000 cycles. Made from virgin steel, the folded U-shape design provides a solid frame for the sensitive PC board to eliminate torque, which could lead to solder joint failure. Also provides excellent shielding against RF and stray magnetic fields. Can I connect a moving coil cartridge to the PH50B? No. The PH50B is designed for moving magnet cartridges. 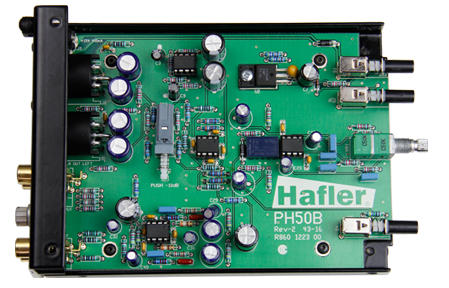 For moving coil designs, the Hafler PH60B is the proper choice. 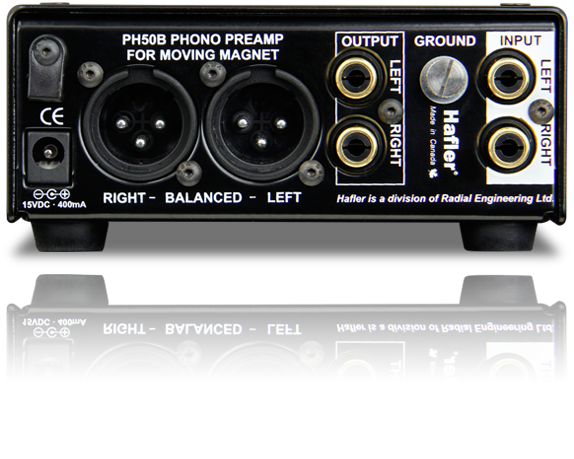 What is the advantage of the PH50B over a built-in phono stage? Unlike most built-in phono stages that are ‘side attraction to the main show’, the PH50B was conceived from the ground up to deliver great sound with low noise for a more exciting and natural experience. 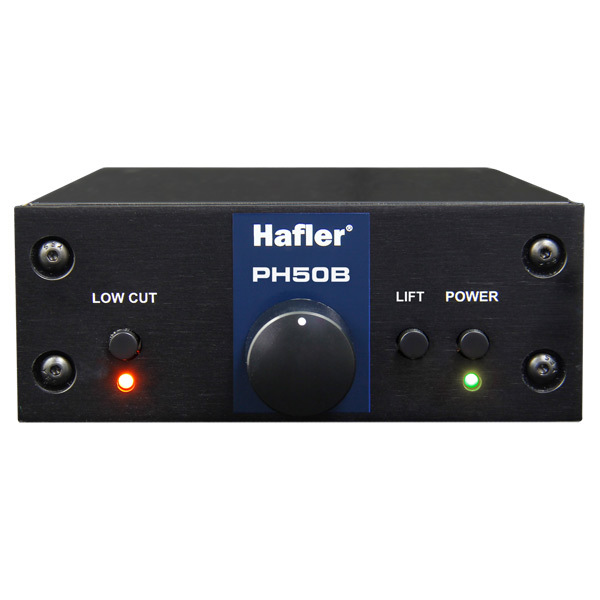 The PH50B also features balanced XLR outputs which allow you to connect to a recording interface or a pro audio system for playback. Can I bypass the RIAA equalization curve inside the PH50B? No. It is built into the PH50B and is part of the circuit board. High impedance RCA cables are generally more prone to picking up noise from radio frequencies and magnetic fields. Thus keeping the cables shorter is beneficial. As a rule, try to keep the RCA output cables from the PH50B under 2 meters (6') in length. 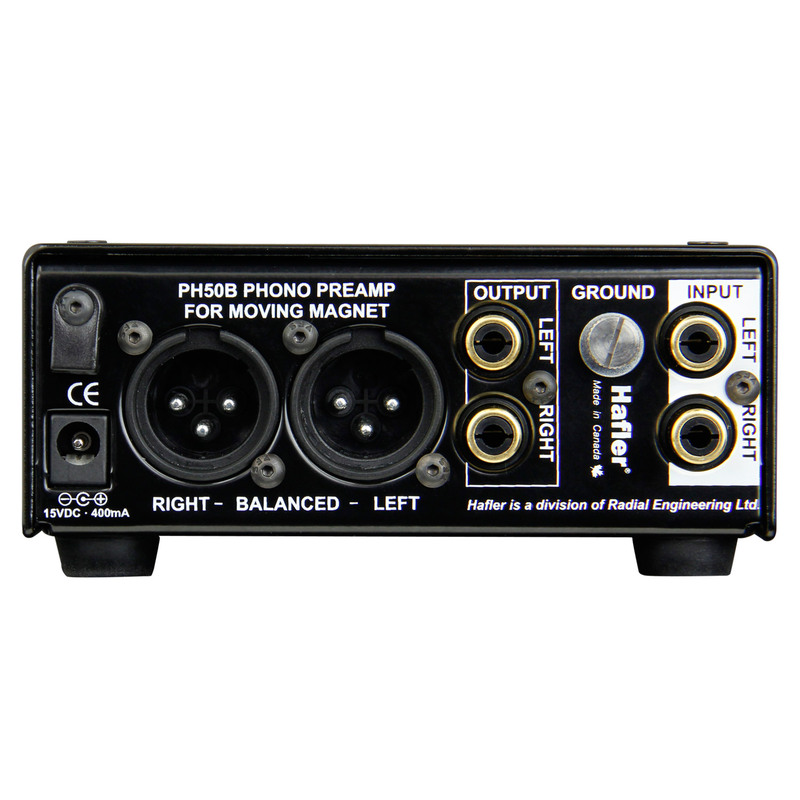 The balanced XLR outputs on the PH50B are designed to connect to the inputs of a recording interface or a pro audio playback system, with cables up to 100m (300') long. 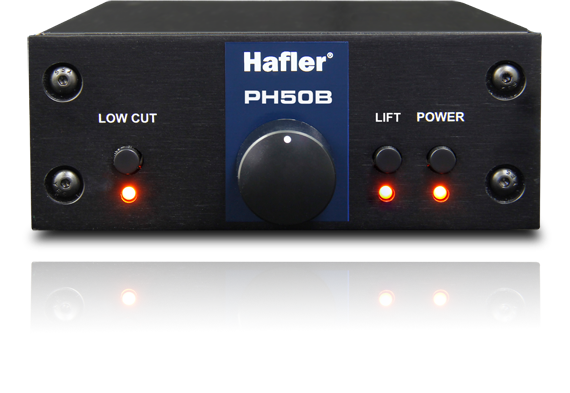 Why does the Hafler PH50B employ an external power supply? The low output from a turntable requires a lot of gain to bring it up to a suitable level. This also makes the circuit much more prone to noise. The transformer in a power supply generates hum which if not kept in check can generate noise; moving the power supply outside the casing significantly reduces the problem. Can I connect the PH50B to my recording interface to transfer my albums? Absolutely, the balanced XLR outputs of the PH50B can be connected directly to the line level inputs of a recording interface, for easy digital transfer of your vinyl collection. Does the impedance on my moving magnet cartridge matter? No. Standards have been established for years with moving magnet cartridges so that they all work within a prescribed range. You simply plug in and you are set to go.